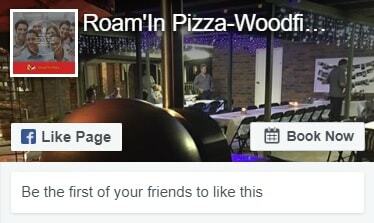 If you have an alfresco function or event, pizza catering offers a great outdoor focal point – the wood-fired oven. Building the pizza fire, watching it burn and having your pizza chef on site to cook the pizzas. It adds interest and entertainment to your outdoor event. 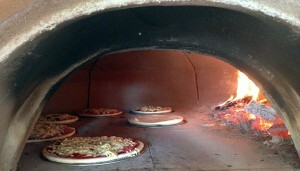 But mobile pizza catering is not limited to outdoor events. If you are holding an event without a kitchen or a kitchen unsuitable for caterers. 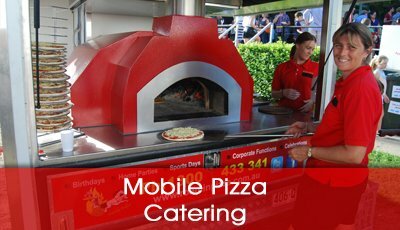 Then the mobile pizza catering option is the perfect solution. Because We bring our own ovens. 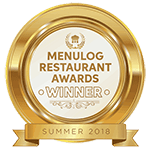 So there’s no need to worry about scaling up a domestic kitchen or having enough room for catering staff to prepare and serve. We can set up outside or next to your function room or venue. As we work independently, without all the mod cons of a kitchen. Pizza is normally considered as an informal meal option. But we’ve catered some of the most sophisticated events imaginable. From weddings to important corporate functions, mobile pizza catering can be made as upmarket as you require. We can help to provide you with a more formal occasion by offering salads along with a customised menu of gourmet pizza options. Our gourmet menu includes more sophisticated options like Pizza Olivato, Spinach and Feta and Margarita. Got a bunch of hungry children to feed? 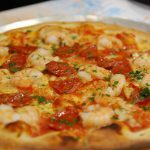 Our classic pizza menu will fill their hungry bellies. Options like Hawaiian, Cheese and Vegetarian are extremely popular with children. Our dessert pizzas are always a hit. Therefore Choose from Caramelised Banana Pizza, Chocolate and Strawberry, Chocolate and Banana and Apple Crumble. Pizza is also a great option for weary parents who don’t want to prepare and clean up a children’s party. With no cutlery or plates required, there are no kitchen duties when the party is over.